Michael Jackson tried to challenge death, but death challenged him back. The materialistic life, in this materialistic world, embraces materialistic death instead of a normal one. This is the rule of life. Do You Know Michael Jackson wanted to live for 150 years. The person who would never put a step forward without the doctors suggestion for his last 25 years, couldn't fufill his dream of living 150 years. 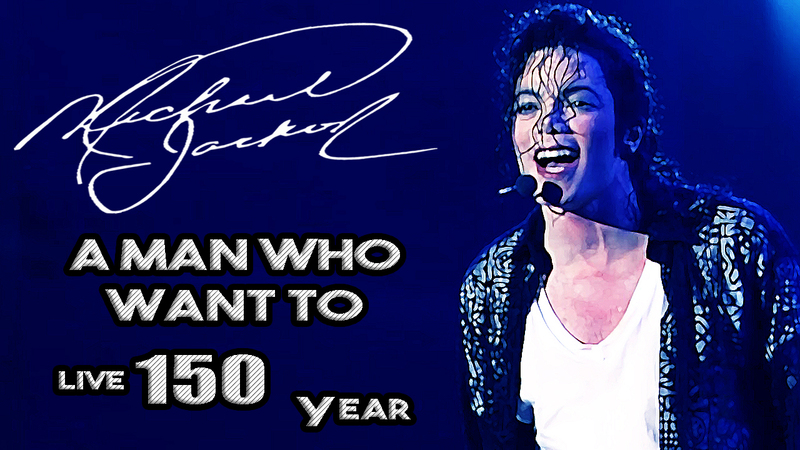 But ones upon a time Michael Jackson wanted to live for 150 years. He appointed 12 to 15 doctors at home, who would daily examine him from hair to toenails. His food was always tested in laboratory before serving. Another 15 people were appointed to look after his daily exercise and workout. His bed had the technology to regulate the oxygen level. Organ donors were kept ready so that whenever needed they could immediately donate their organ . The maintenance of these donors were taken care of by him. He was proceeding with a dream of living for 150 years. Alas ! He failed. Death grab his mind and then his body. On 25th June 2009, at the age of 50, his heart stopped functioning. The constant effort of those 12 doctors didn't work. Even, the combined efforts of doctors from Los Angeles and California too couldn't save him. The person who would never put a step forward without the doctors suggestion for his last 25 years, couldn't fufill his dream of living 150.